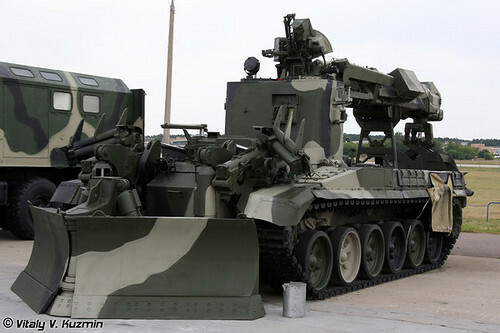 The Russian T-90 IMR-3M Combat Engineer Vehicle is based on the T-90 tank hull. The vehicle’s working equipment incorporates a universal bulldozer attachment, a telescopic jib with a universal working tool, and a tread way plough sweep, designated KMT-R3, complete with an electromagnetic attachment. It is operated by a 2 man crew. 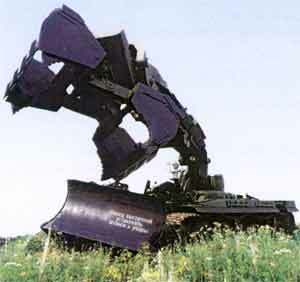 The Russian T-90 IMR-3M Combat Engineer Vehicle is used to ..
– felling trees and pulling stumps.